Capture the ideal blend of flexible style and excellent durability with a vinyl floor installation. Homeowners throughout the area choose vinyl floors when they want low-maintenance, high quality flooring for any room in their homes. This long-lasting flooring option comes in a variety of formats for specialized applications. These include luxury sheet vinyl for easy installation, vinyl tile flooring for affordable, stylish patterns, and vinyl plank flooring for the space-expanding look of natural wood without the high cost. Come in today to talk to a flooring expert about the best vinyl floor for your home. Area homeowners value courtesy and professionalism in their flooring installers, and our locally owned flooring warehouse has the perfect team for any job. The advantages of vinyl floors start at installation, providing time and money savings throughout the process. Luxury sheet vinyl provides numerous benefits, especially when flooring multiple contiguous rooms. Your flooring purchase includes a free in-home measurement, which will guide our installers as they pre-cut your sheet vinyl. Once this is completed, the sheet can be rolled out to conform perfectly to the contours of the room. A major strength of sheet vinyl is in its smooth transitions from room to room without unsightly breaks in the flooring pattern or material. Vinyl tile and vinyl plank flooring are appropriate for a variety of applications, especially when homeowners want the look of natural materials without the high maintenance. Flexible vinyl can be printed to mimic any natural material, from ceramic, porcelain, and natural stone tiles to engineered and solid hardwood planks. Installing these planks or tiles is faster than the natural materials, as well. Because vinyl can be cut with a standard utility knife, it is easy and safe for our expert installers to shape it to match the existing room. Because vinyl floors can be installed at any level, it is one of the best materials for any room of your home. However, the durability of vinyl makes it the affordable choice for high-traffic areas. Vinyl is springy underfoot, which makes it easy to stand on for long periods of time, but it is also holds up well under foot traffic. The scratch, stain, and moisture resistance of vinyl make it an excellent choice for the kitchen, where its low-maintenance requirements will be especially appreciated. 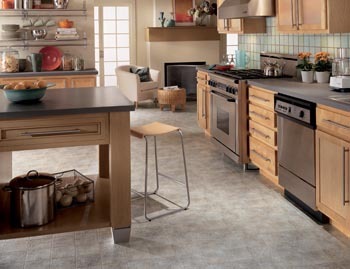 Let us help you find the perfect vinyl flooring for your home. Call today to talk to a flooring expert about the many benefits of modern luxury vinyl.